The Fisker Karma plug-in hybrid sedan goes on sale next year. Here are some details. Vic Doolan is looking for a few good U.S. dealers. Forty, to be precise. 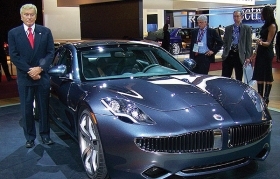 The former BMW and Volvo executive is establishing a global dealer network to sell the large, luxurious plug-in hybrid vehicles being developed by Fisker Automotive Inc., of Irvine, Calif.
Fisker's first car, the 2010 Karma, is a four-door sedan with sticker prices ranging from $87,500 to $106,000. Sales begin next year. "We are trying to leverage what is in place today by selecting retailers who have a proven track record and customer satisfaction, are in the right location and, preferably, have premium experience," said Doolan, who also is a Fisker board member. The company touts itself as environmentally friendly and urges dealers to adopt environmental policies that conserve resources, such as using an existing building for a showroom rather than building a new structure. Fisker also wants small showrooms of 800 to 1,000 square feet. "We are not great believers in mausoleums," said Doolan, who was interviewed this month at the Detroit auto show. "We take the view that we want eco-facilities, not ego facilities." Doolan estimates the cost to become a Fisker dealer at $350,000 to just under $1 million, depending on location. That includes such things as purchasing two demonstrator cars, parts and signs; training; and creating the showroom. Two service bays are required. Doolan said 25 U.S. dealers have been selected. Fisker aims for 15,000 annual global sales, half in the United States. Doolan said the automaker has 1,300 global orders. The models were designed by Fisker Automotive CEO Henrik Fisker, who was responsible for such designs as the BMW Z8 and the Aston Martin DB9 and V8 Vantage. The plug-in hybrid technology with a lithium ion battery pack was developed by Quantum Technologies. The Karma will be assembled in Finland by Valmet Automotive, which also assembles the Porsche Boxster and Cayman. Fisker Automotive will launch with the Karma, which is nearly the size of a Chevrolet Impala and is being marketed as an environmentally friendly sedan with style and luxury touches. "At the end of this year, there will be a few cars going to select people," Doolan said. "Then in early 2010 we will be allocating the dealer demonstrators. In the middle of 2010 we start delivering to customers." The hardtop convertible debuts in mid-2011. An unspecified third model will arrive later.